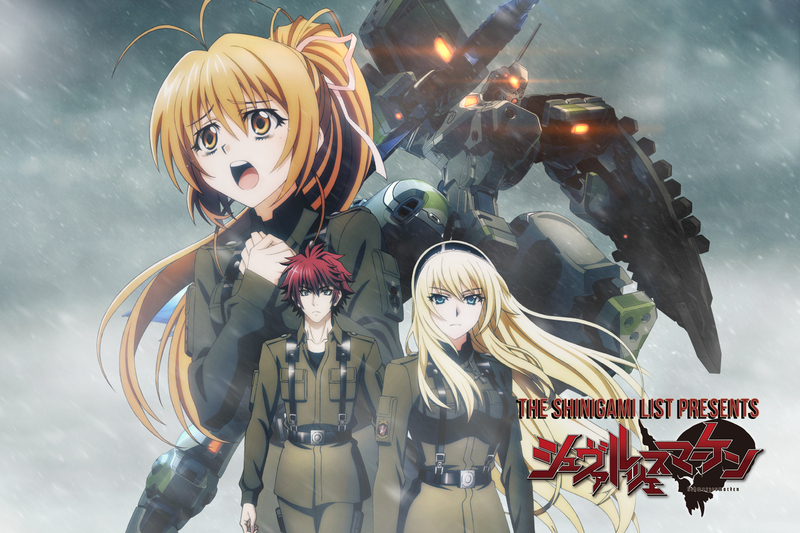 This anime will adapt the MuvLuv Alternative Schwarzesmarken Muv-Luv spin-off. We will follow the 666th TSF Squadron of the East Germany army during the 1983 clashes. Schwarzesmarken is the code name of this squadron. The new war-type anime Schwarzesmarken will begin on 10th January 2016. The first episode will air on TV Tokyo at 01:05. But even if you miss it, you can watch it on other channels, depending on the region. Check the details below. Here is some basic information about when and how you can watch the show, if you are based in Japan or have access to Japanese media. Keep in mind that the times are subject to change. AT-X will also show the anime. The first episode will premiere there on 15th January at 23:30. Replays will be available every Sunday (20:30), Monday (15:30), and Thursday (07:30). In this anime we will meet the two warring forces of the Stasi and the Schwarzesmarken squadron of the East Germany army. Their task is easy – challenge and stop all BETA forces with the help of unconventional tactics (suits and weapons no normal unit would have nor use). While the 1983 battles are in their peak, we will fall right in the midst of the battlefield with the 666th squadron of the Eastern warriors – pilots of unique mecha-like costumes and the Stasi enemies. The most of the team operate MiG-21s. The black Marks (t. Schzarzesmarken) do not need to accept and distress call or take on any action on the way to their mission. They need not distract from their aim. Disclaimer: Please note that all information is taken from the original work and some might be considered a spoiler. It is an unintentional one, as I have not yet any idea what exactly will be included in the anime and when will the information appear during the series. Irisdina Bernhard a.k.a. Schwarzesmarken 01 is commanding officer of the squadron. She is a renowned hero of the Poland retreat. People call her The Ice Queen because of her ability to always keep her cool. She is the only member of the team to operate a MiG-21PF. Her seiyuu is Nozomi Yamamoto (Joshiraku’s Tetora Bouhatel). Pham Thi Lan a.k.a. Schwarzesmarken 02 second in command and the second in command of the squadron. She is second generation local, after her grandparents moved from the Philippines. Her seiyuu is Emiri Katou (Bakemonogatari’s Mayoi Hachikuji). Theodor Eberbach a.k.a. Schwarzesmarken 08 is a close-combat specialist. Favourite weapon is knife. He expresses strong hatred towards the Stasi and the Schwarzesmarken captain Irisdina Bernhard. His seiyuu is Kenichi Suzumura (Gintama’s Sougo Okita). Anett Hosenfeld a.k.a. Schwarzesmarken 06 suffers from the PSTD because her three best friends died during their first deployment as the 666th squadron. Her hatred is for Theodor, who she thinks abandoned them to die. Her seiyuu is Chika Anzai (Hitsugi no Chaika’s Chaika Trabant). Katia Waldheim is a West German Army officer, scouted by the 666th TSF squadron when her unit got annihilated. She is always ready to learn and extremely idealistic. Her seiyuu is Minami Tanaka (Wake up Girls!’s Minami Katayama). Lise Hohenstein is Theodor’s sister in law. Thought to have been murdered by the Stasi three years prior to the events in Schwarzesmarken (and at the time Theodor supposedly joined the army), she returns as a reinforcement pilot early in the story. Her seiyuu is Yoshino Nanjo (Canaan’s Maria Oosawa). Gretel Jeckeln is a commissar assigned to the 666th. She is not as skilled a pilot, but has excellent political knowledge. Her seiyuu is Kiyono Yasuno (Ushio to Tora’s Mayuko Inoue). Sylwia Krzesińska was Polish, but is now totally up for the 666th squad. Her aim is survival and she fights with the Schwarzesmarken to improve her chances. Her seiyuu is Michiyo Murase (Little Witch Academia’s Sucy Manbavaran). Walter Kruger is irisdina’s staff officer, assisting her in the command of the 666th. His seiyuu is Kenta Miyake (Wolf’s Rain’s Tsuba). Beatrix Brehmer is one of the main antagonists in the story. She is a former classmate of Irisdina and current commander of the Stasi. She holds a special place in her heart, reserved for deserters and traitors. Her seiyuu is Yukari Tamura. Heinze Axmann a.k.a. the Brown Beast is a second one of the main antagonists and commander of the TSF Guard Force (Stasi). he and Beatrix used to be in a rather uneasy relationship. He is notorious as a torturer, for his cruelty and sadistic means. His seiyuu is Ken Narita (InuYasha’s Sesshoumaru). The ending theme song “Kanashimi ga jidai wo Kakeru” will be performed by Zähre. Both songs are also part of the original Schwarzesmarken visual novel game soundtrack. This show is definitely a nice treat for the Muv-Luv fans. If you want to check out the other cool anime expected in the winter 2015/2016 season, check out my guide! As long as there is mecha, I will check it out. All we have from the event, and which I have not included in the announcement news article, is that Hoshino-sensei confirmed it will be a continuation of the previous anime and not a reboot. However, it was obvious as we see Allen’s form AND Karma in the main (key) visuals on the site. Also, in the original anime adaptation, we could barely call Link a protagonist, while he is clearly called such in the characters part of the site now. Oh, thank you so much! I was hoping for it to be a continuation!